Among the public meeting places of nineteenth-century Vienna, the dance hall held a prominent position. According to one's social class or the time of year, the location might be an urban dance hall, a rural open-air gathering, or some grand society location. There the latest dance creations vied for attention with the old favourites. Of the dance styles that prevailed, those that enjoyed the greatest popularity during the period included the waltz, polka and galop. Among the dance-musicians, none rivalled the various members of the Strauss family. Increasingly, their compositions have been perceived to rise above the normal limitations of the dance form, becoming at times miniature tone poems. From the dance halls of Vienna their music spread around the globe, creating a demand which they helped to satisfy with tours of their own. During the 1830s and 1840s, the elder Johann Strauss (1804-1849), the founder of the dynasty, made gruelling trips around Europe by coach. Later, tours by his three sons - Johann the younger (1825-1899), Josef (1827-1870) and Eduard (1835-1916) - helped to develop the family's popularity still further. Reductions in orchestration were made at that time by the elder Johann in order to meet the demands of smaller ensembles. More recently, a Viennese musicologist has made reductions in a similar style, and it is a selection of such arrangements that The Gaudier Ensemble plays here. Among the public meeting places of nineteenth-century Vienna, the dance hall held a prominent position. According to one’s social class or the time of year, the location might be an urban dance hall, a rural open-air gathering, or some grand society location. There the latest dance creations vied for attention with the old favourites. Of the dance styles that prevailed, those that enjoyed the greatest popularity during the period included the waltz, polka and galop. 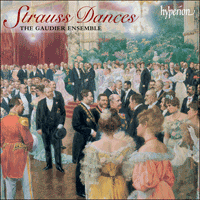 Among the dance-musicians, none rivalled the various members of the Strauss family. Increasingly, their compositions have been perceived to rise above the normal limitations of the dance form, becoming at times miniature tone poems. From the dance halls of Vienna their music spread around the globe, creating a demand which they helped to satisfy with tours of their own. During the 1830s and 1840s, the elder Johann Strauss (1804-1849), the founder of the dynasty, made gruelling trips around Europe by coach. Later, tours by his three sons – Johann the younger (1825-1899), Josef (1827-1870) and Eduard (1835-1916) – helped to develop the family’s popularity still further. The orchestra conducted by the elder Johann Strauss typically comprised some 25 performers, made up of strings, flute, oboe, two clarinets, bassoon, two trumpets, two horns and trombone. The younger Johann’s orchestra was somewhat larger, with a standard orchestration of double woodwind, four horns, two trumpets, and trombone. Their orchestrations normally involved a basic harmonisation from the strings, to which wind and brass instruments added colour. To meet the demands of other, smaller ensembles, the elder Johann’s dances were commonly published in reduced instrumentation that retained the harmonic structures of the original and added such colour as available wind instruments permitted. More recently, the Viennese musicologist Alexander Weinmann (1901-1987) made reductions in similar style, and it is a selection of such arrangements that The Gaudier Ensemble plays here. The elder Johann Strauss began his career with his own orchestra in October 1825, a month after splitting from his friend and rival, Joseph Lanner. Before long his dance compositions became sufficiently popular to find their way into print. Galops form a significant part of his early output, since the style was one of the most popular of the 1820s and 1830s. They provided dancers with lively but – to avoid over-exhaustion – necessarily brief exertion. The Seufzer-Galopp (‘Sigh Galop’) was among a batch of Strauss’s dances published in December 1828, the sighs of the title being depicted in the falling notes of the fourth of the dance’s four eight-bar sections. Also in that same batch of dances was the frothy Chineser-Galopp (‘Chinese Galop’), whose brief melodic phrases and instrumental interplay do indeed combine to suggest a somewhat oriental sound. Likewise the Jugendfeuer-Galopp (‘Fire of Youth Galop’), which was first performed in August 1836 at a summer gathering at Vienna’s ‘Golden Pear’ inn, exudes the fire of youth in every bar. It was at a summer gathering at the same venue that the Cachucha-Galopp was introduced in August 1837. The dance’s main theme had recently created a sensation in Vienna when danced by the celebrated dancer Fanny Elssler (1810-1884). She had made it her party piece after dancing it in the ballet Le Diable Boiteux in Paris in 1836. A note on the galop’s original orchestral score in the collection of the Gesellschaft der Musikfreunde in Vienna suggests that Strauss’s dance was composed an hour before the ball, written out by copyists, performed without rehearsal, and repeated three times in response to the applause it received. The Gitana-Galopp (‘Gipsy Galop’, 1839) is its direct companion, and once again it draws on existing Spanish themes. Those themes may be familiar from Angèle’s aria ‘Flamme vengeresse’ in Auber’s opera Le Domino Noir, and the process by which they came to be used by Strauss was seemingly somewhat tortuous. Apparently Auber used the themes originally for a pas de deux written for a revival of La Muette de Portici. They were then re-used in Le Domino Noir in 1837, and in a ballet La Gitana staged in St Petersburg for Marie Taglioni in 1838. This ballet was then staged in Vienna in April 1839, when Strauss composed his galop. The earliest of the waltzes in the present collection is the Tivoli-Rutsch-Walzer (‘Tivoli Slide Waltz’), which Strauss introduced at a gathering at Vienna’s Tivoli pleasure gardens in the Upper Meidling suburb on 9 October 1830. Like the still-surviving pleasure gardens established in Copenhagen around the same time, the Viennese entertainment spot took its name from a pleasure resort outside Rome. That in Vienna opened in September 1830, with Strauss as one of its musical directors. On 4 October, a celebration of the Name Day of Emperor Franz attracted six thousand visitors. So many were excluded that a repeat celebration was arranged, and it was then that Strauss performed his new waltz. The title commemorates a slide that was one of the garden’s main attractions – not a slide that children (and, of course, some adults!) slide down on their backsides, but one down which couples rode on a kind of carriage mounted on a sledge. The sliding effect is clearly depicted a few bars from the end in the waltz’s coda. It was in November 1839 that Vienna’s leading dance hall of the time, the Sperl, echoed to the sound of the elder Johann Strauss’s Wiener Gemüths-Walzer (‘Viennese Good-Nature Waltz’), a piece that was dedicated to the young Prince Nikolaus Esterházy (1817-1894). Another of Strauss’s waltzes, and possibly his best loved of all, is Loreley-Rheinklänge (‘Sounds of the Lorelei on the Rhine’). It includes a distinctive four-note phrase and echo for clarinet and horn in the introduction that preview further treatment in the main waltz. The composition was greeted with huge applause when first performed at a summer festivity in August 1843, attended by over 3400 people. It was a charity event in aid of Vienna’s St Joseph’s Children’s Hospital, held in lovely weather at another of Vienna’s summer entertainment spots – the Wasser- Glacis. This was situated in the former moat around the old Vienna city walls that survived until the late 1850s. Down the ages, dance halls have periodically resounded to new dance styles, and during the 1840s they were gripped with polka fever. The elder Strauss’s Annen-Polka, which is not to be confused with the more familiar work of the same name by the younger Johann Strauss, was only his second dance in the style, but it would remain one of his most popular dances. It was introduced in August 1842 at a summer festival in the Volksgarten in honour of the Empress Maria Anna. The Salon-Polka was another that was introduced at the Volksgarten, but at a night-time festival for Strauss’s benefit in July 1844. As for the curiously titled Eisele- und Beisele- Sprünge (‘Eisele and Beisele Leaps’), it celebrates a pair of newspaper cartoon characters, Baron Beisele and his steward Dr Eisele, who were introduced in early 1846 in the Munich comic paper Fliegende Blätter. The newspaper had the idea of sending the cartoon characters on a tour, and in November 1846 this took them to Vienna. The publicity and interest created were phenomenal, and the two characters might as well have been real-life celebrities. Their images were created in marzipan and porcelain, and theatrical burlesques and balls were put on in their honour. It was for one of the latter at the Odeon ballroom in Vienna in February 1847 that Strauss composed this jolly polka, whose bouncy phrases suggest the leaps of the title. The Exeter-Polka, by contrast, was created in connection with a real-life journey of Johann Strauss himself to London from April to July 1849. This was his second visit to the British capital, following an earlier one for Queen Victoria’s coronation in 1838. One of the London venues at which he and his band played was the Exeter Hall, which stood in the Strand where the Strand Palace Hotel is today. It was for the first of his concerts there, on 14 May 1849, that Strauss composed the Exeter-Polka. Alas it was to prove one of the very last of all of his compositions. Shortly after his return to Vienna he contracted scarlet fever from one of his illegitimate children and died on 25 September at the age of only 45. The Strauss family tradition was immediately taken over by his eldest son, who already headed his own orchestra. Indeed the younger Johann’s Scherz Polka (‘Joke Polka’) was first heard at the Sperl ballroom just a couple of months after the elder Johann’s death. The title refers not to any specific joke but to the general playfulness of the composition. The younger Johann’s music was always more lyrical, more relaxed and more refined than that of his father, his style lacking the latter’s unquenched restlessness. This is particularly evident in the graceful Liebeslieder-Walzer (‘Love-Song Waltzes’), which were among the earliest of the younger Johann’s big successes. They were first performed at a summer concert in the Volksgarten in June 1852. Of the others, Thermen (‘Thermal Springs’) was composed for a ball of the medical students of the Vienna High School in January 1861. Finally, the southern warmth that radiates from Wo die Zitronen blühn (‘Where the Lemon Trees Blossom’) reflects the fact that Strauss wrote it for a concert tour of Italy in 1874. He first conducted it in Milan under the title Bella Italia (‘Beautiful Italy’). Its ultimate title comes from Mignon’s song from Goethe’s Wilhelm Meister – ‘Kennst du das Land, wo die Zitronen blühn?’. Parmi les lieux de réunion publique du Vienne du XIXe siècle, la salle de bal occupa une place essentielle. Selon la classe sociale de chacun ou l’époque de l’année, il pouvait s’agir d’une salle de bal urbaine, d’un rassemblement rural en plein air ou de quelque endroit mondain majestueux. Là, les toute dernières danses rivalisaient avec les vieilles danses à succès et plusieurs styles prévalaient alors, la valse, la polka et le galop étant de ceux qui jouissaient de la plus grande popularité. Aucun musicien de danse n’égala les divers membres de la famille Strauss, dont les compositions furent de plus en plus perçues comme transcendant les limites habituelles de la forme de danse, jusqu’à devenir parfois des poèmes symphoniques miniatures. Partie des salles de bal viennoises, leur musique fit le tour du globe, suscitant une demande qu’ils contribuèrent à satisfaire en organisant leurs propres tournées. Durant les années 1830-1840, Johann Strauss I (1804-1849), fondateur de la dynastie, parcourut toute l’Europe au prix d’éreintants voyages en diligence. Plus tard, les tournées de ses trois fils – Johann II (1825-1899), Josef (1827-1870) et Eduard (1835-1916) – concoururent à développer davantage encore la popularité familiale. L’orchestre dirigé par Johann Strauss I comprenait habituellement quelque vingt-cinq exécutants – cordes, flûte, hautbois, deux clarinettes, basson, deux trompettes, deux cors et trombone. L’orchestre de Johann II, un peu plus grand, comptait ordinairement des bois doubles, quatre cors, deux trompettes et trombone. Leurs orchestrations impliquaient en général une harmonisation de base issue des cordes, à laquelle vents et cuivres adjoignaient leur couleur. Pour répondre aux besoins d’ensembles plus modestes, les danses de Johann I étaient couramment publiées dans une instrumentation réduite qui conservait les structures harmoniques originelles et ajoutait une couleur en adéquation avec les vents disponibles. Plus récemment, le musicologue viennois Alexander Weinmann (1901-1987) réalisa des réductions dans un style similaire, arrangements dont le Gaudier Ensemble interprète ici une sélection. Johann Strauss I débuta sa carrière, avec son propre orchestre, en octobre 1825, un mois après s’être séparé de son ami et rival, Joseph Lanner. Ses compositions de danse devinrent bien vite assez populaires pour être imprimées. Le galop, l’un des styles les plus populaires des années 1820-1830, constitue une part importante de sa production de jeunesse. Il était, pour les danseurs, l’occasion d’un exercice animé mais – pour éviter tout épuisement à outrance – nécessairement bref. Le Seufzer-Galopp (« Galop des soupirs ») appartenait à un corpus de danses de Strauss publié en décembre 1828, les soupirs du titre étant dépeints dans les notes descendantes de la dernière des quatre sections à huit mesures de la danse. Ce même corpus contenait le Chineser-Galopp (« Galop chinois »), dont les brèves phrases mélodiques et le jeu instrumental se combinent effectivement pour évoquer une sonorité un peu orientale. À l’identique, chaque mesure du Jugendfeuer- Galopp (« Galop du feu de la jeunesse »), créé en août 1836 lors d’un rassemblement estival à la taverne viennoise « La Poire d’or », déborde du feu de la jeunesse. Un autre événement estival organisé au même endroit, en août 1837, vit la première présentation du Cachucha- Galopp, dont le thème principal venait alors de faire sensation à Vienne pour avoir été interprété par la célèbre danseuse Fanny Elssler (1810-1884), qui en avait fait son morceau de circonstance après l’avoir exécuté dans le ballet Le Diable boiteux, à Paris, en 1836. Une apostille figurant sur la partition orchestrale originale de ce galop, conservée à la Gesellschaft der Musikfreunde de Vienne, suggère que la danse de Strauss fut composée une heure avant le bal, consignée par les copistes, exécutée sans répétition et reprise trois fois pour répondre aux applaudissements du public. Le Gitana-Galopp (Galop gitan, 1839) en est le pendant direct. Une fois de plus, il fait appel à des thèmes préexistants d'inspiration espagnole. Ces thèmes dénotent une familiarité certaine avec l'air 'Flamme vengeresse' d'Angèle dans Le Domino noir, un opéra d'Auber. Le procédé par lequel Strauss finit par s'en servir est quelque peu tortueux : apparemment, Auber les avait initialement écrits pour un pas-de-deux lors de la reprise de La Muette de Portici. Ils réapparurent ensuite dans Le Domino noir en 1837 et dans un ballet La Gitana mis en scène à Saint- Pétersbourg pour Marie Taglioni en 1838. Ce ballet fut ensuite mis à l'affiche à Vienne en avril 1839, une occasion pour Strauss de composer et faire jouer son galop. Strauss créa la plus ancienne valse du présent recueil, le Tivoli-Rutsch-Walzer (« Valse du toboggan de Tivoli »), dans les jardins d’agrément de Tivoli, dans le faubourg viennois du haut Meidling, le 9 octobre 1830. À l’instar des jardins d’agrément, toujours existants, établis à Copenhague vers la même époque, ce lieu de divertissement viennois devait son nom à une station d’agrément des extérieurs de Rome. L’endroit ouvrit à Vienne en septembre 1830, et Strauss en fut l’un des directeurs musicaux. Le 4 octobre, une célébration de la fête de l’empereur Franz attira six mille visiteurs. Les exclus furent si nombreux qu’une autre célébration fut organisée, au cours de laquelle Strauss interpréta sa nouvelle valse. Le toboggan évoqué dans le titre était l’une des grandes attractions des jardins – pas un de ces toboggans que les enfants (et, bien sûr, certains adultes !) dévalent sur les fesses, mais un de ceux que des couples descendaient sur une sorte de calèche montée sur luge. L’effet de glissement est clairement rendu à quelques mesures de la fin, dans la coda de la valse. Ce fut en novembre 1839 que la grande salle de bal viennoise de l’époque, le Sperl, résonna des échos du Wiener Gemüths-Walzer (« Valse de l’âme viennoise »), dédié au jeune prince Nikolaus Esterhàzy (1817-1894). La valse Loreley-Rheinklänge (« Sonorités rhénanes de la Lorelei »), peut-être la préférée de Strauss, recèle une distinctive phrase de quatre notes et un écho pour clarinette et cor, dans l’introduction, qui préfigurent le traitement ultérieur dans la valse principale. Cette composition reçut un tonnerre d’applaudissements à sa création, devant trios mille quatre cents personnes, lors d’une fête organisée au profit de l’hôpital des enfants de Saint-Joseph, par une charmante journée d’été, dans un autre lieu de divertissement estival viennois : le Wasser-Glacis, situé dans les anciennes douves cernant les remparts de la vieille ville, qui survécurent jusqu’à la fin des années 1850. Au fil des ans, les salles de bal résonnèrent périodiquement aux sons de nouveaux styles de danse et furent gagnées, dans les années 1840, par la fièvre de la polka. L’Annen-Polka de Strauss I – à ne pas confondre avec l’Annen-Polka de Strauss II, plus connue – n’était que la deuxième polka du compositeur, mais elle allait devenir l’une de ses danses les plus populaires. Elle fut présentée en août 1842, au cours d’une fête d’été donnée dans le Volksgarten en l’honneur de l’impératrice Maria Anna. La Salon-Polka fut, elle aussi, présentée au Volksgarten, mais dans le cadre d’une fête nocturne au profit de Strauss, en juillet 1844. Quant à la pièce curieusement intitulée Eisele- und Beisele-Sprünge (« Les bonds d’Eisele et de Beisele »), elle célèbre deux personnages comiques, le baron Beîsele et son intendant le Dr Eisele, apparus pour la première fois, au début de 1846, dans le journal humoristique munichois Fliegende Blätter. Ce journal eut l’idée d’envoyer ses personnages en voyage, ce qui les conduisit, en novembre 1846, à Vienne. La publicité et l’intérêt suscités furent phénoménaux, dignes de vraies célébrités. On façonna leurs images en pâte d’amande et en porcelaine et des parodies burlesques, des bals furent même donnés en leur honneur. Ce fut d’ailleurs pour l’un d’eux, organisé à la salle de l’Odéon, à Vienne, que Strauss composa, en février 1847, cette joviale polka, dont les phrases pleines d’entrain évoquent les bonds du titre. A contrario, l’Exeter-Polka se rapporte à un authentique voyage de Johann Strauss à Londres, d’avril à juillet 1849. Il s’agissait de son second séjour dans la capitale britannique, le premier s’étant déroulé à l’occasion du couronnement de la reine Victoria, en 1838. À Londres, il joua notamment, avec son orchestre, à l’Exeter Hall, qui se dressait à la place de l’actuel Strand Palace Hotel. Ce fut pour son premier concert, le 14 mai 1849, que Strauss composa l’Exeter-Polka, qui devait être, hélas, l’une de ses toute dernières compositions. Peu après son retour à Vienne, il contracta en effet la scarlatine auprès de l’un de ses enfants illégitimes et mourut le 25 septembre – il n’avait que quarante-cinq ans. La tradition de la famille Strauss fut immédiatement reprise par son fils ainé, déjà à la tête de son propre orchestre, et la Scherz-Polka (« Polka du badinage ») de Johann II fut créée à la sale de bal du Sperl deux mois seulement après la mort de Johann I. Le titre fait allusion à l’espièglerie générale du morceau. La musique de Johann II fut toujours plus lyrique, plus détendue et plus raffinée que celle de son père, au style empreint d’impatience inassouvie. Ceci vaut particulièrement pour les gracieux Liebeslieder-Walzer (« Valses des chants d’amour »), créés lors d’un concert estival donné dans le Volksgarten, en juin 1852, qui furent parmi les tout premiers grands succès de Johann II. Quant à la pièce Thermen (« Sources thermales »), elle fut composée pour un bal d’étudiants en médecine viennois, en janvier 1861. Enfin, la chaleur méridionale qui irradie de Wo die Zitronen blühn (« Où fleurissent les citronniers ») reflète le contexte initial de cette oeuvre, composée pour une tournée de concerts italienne, en 1874. Strauss la dirigea pour la première fois à Milan sous le titre Bella Italia (« Belle Italie »), finalement remplacé par un titre emprunté au chant de Mignon dans Wilhelm Meister de Goethe – « Kennst du das Land, wo die Zitronen blühn ? ». Unter den öffentlichen Treffpunkten im Wien des 19. Jahrhunderts nahm der Tanzsaal eine besondere Stellung ein. Je nach sozialem Rang oder Jahreszeit mochte der tatsächliche Schauplatz ein Tanzsaal in der Stadt, eine ländliche Zusammenkunft im Freien oder ein Ball der feinen Gesellschaft sein. Dort wetteiferten die neuesten Tanzschöpfungen mit den altbekannten Favoriten. Von den vorherrschenden Tanzstilen gehörten während der fraglichen Epoche Walzer, Polka und Galopp zu den beliebtesten. Von den Tanzmusikern konnten sich keine mit den diversen Mitgliedern der Familie Strauß messen. Man ist zunehmend der Ansicht, daß ihre Kompositionen sich über die üblichen Beschränkungen der Tanzform erheben und zeitweise zu Tondichtungen im Miniaturformat werden. Aus den Tanzsälen Wiens verbreitete sich ihre Musik um die ganze Welt und schuf eine Nachfrage, die sie mit eigenen Tourneen zu befriedigen halfen. Während der 1830er und 1840er Jahre unternahm Johann Strauß (Vater, 1804-1849), der Begründer der Dynastie, mit der Kutsche strapaziöse Konzertreisen durch Europa. Später halfen Tourneen seiner drei Söhne Johann (1825- 1899), Josef (1827-1870) und Eduard (1835-1916), die Popularität der Familie weiter zu erhöhen. Das von Johann Strauß (Vater) geleitete Orchester umfaßte typischerweise rund fünfundzwanzig Musiker und bestand aus Streichern, Flöte, Oboe, zwei Klarinetten, Fagott, zwei Trompeten, zwei Hörnern und Posaune. Das Orchester von Johann (Sohn) war etwas größer, mit einer Standardbesetzung aus doppelten Holzbläsern, vier Hörnern, zwei Trompeten und Posaune. Bei ihren Orchestrierungen lieferten die Streicher gewöhnlich die grundlegende Harmonisierung, der die Holz- und Blechbläser ihre Klangfarben hinzufügten. Um den Bedürfnissen anderer, kleinerer Ensembles zu genügen, wurden die Tänze von Johann (Vater) in der Regel in reduzierter Instrumentierung veröffentlicht, welche die Harmonien des Originals beibehielt und zusätzliche Klangfarben den jeweils verfügbaren Bläsern überließ. In jüngerer Zeit hat der Wiener Musikwissenschaftler Alexander Weinmann (1901-1987) Reduktionen in ähnlichem Stil erstellt, und eine Auswahl solcher Arrangements spielt das Gaudier Ensemble hier. Johann Strauß (Vater) begann seine Karriere als Leiter eines eigenen Orchesters im Oktober 1825, einen Monat nachdem er sich von seinem Freund und Rivalen Joseph Lanner getrennt hatte. Bald darauf waren seine Tanzkompositionen bereits beliebt genug, um im Druck zu erscheinen. Galopps bildeten einen erheblichen Teil seines frühen Schaffens, da dieser Stil in den 1820er und 1830er Jahren besonders beliebt war. Sie boten Tänzern eine schwungvolle, aber (um Überanstrengung zu vermeiden) kurze Möglichkeit, sich auszutoben. Der Seufzer-Galopp gehört zu einer im Dezember 1828 publizierten Gruppe von Strauß’ Tänzen – die Seufzer des Titels werden in den absteigenden Quarten im letzten der vier achttaktigen Abschnitte des Tanzes dargestellt. Zur selben Gruppe gehört der überschäumende Chineser-Galopp, dessen kurze melodische Phrasen und instrumentales Wechselspiel einen quasi orientalischen Klang andeuten. In ähnlicher Weise strahlt der Jugendfeuer-Galopp, der im August 1836 bei einem Sommerfest im Wiener Gasthof ‘Zur Goldenen Birne’ uraufgeführt wurde, in jedem Takt das Feuer der Jugend aus. Bei einem Sommerfest am gleichen Ort wurde im August 1837 auch der Cachucha-Galopp vorgestellt. Das Hauptthema des Tanzes hatte kurz zuvor in Wien ungeheures Aufsehen erregt, als die gefeierte Tänzerin Fanny Elßler (1810-1884) dazu tanzte. Sie hatte es zu ihrem Schaustück gemacht, nachdem sie es 1836 in Paris im Ballett Le Diable Boiteux getanzt hatte. Eine Anmerkung auf dem Original der Orchesterpartitur in der Sammlung der Gesellschaft der Musikfreunde deutet darauf hin, daß Strauß den Tanz eine Stunde vor dem Ball komponiert hat und ihn dann von Kopisten ausschreiben ließ, daß er ihn mit seinem Ensemble ohne Probe aufgeführt hat und wegen des großen Applauses dreimal wiederholen mußte. Der Gitana-Galopp (1839) ist das unmittelbare Gegenstück und greift ebenfalls auf vorhandene spanische Themen zurück. Die Themen mögen dem Hörer aus Angèles Arie ‘Flamme vengeresse’ in Aubers Oper Le Domino Noir bekannt sein, doch Strauß kam offenbar auf recht verschlungenen Wegen dazu, sie zu benutzen. Wie es scheint, hat Auber sie ursprünglich in einem Pas de deux verarbeitet, das für eine Wiederaufnahme von La Muette de Portici vorgesehen war. Im Jahre 1837 verwendete er sie sowohl in Le Domino Noir als auch in einem Ballett mit dem Titel La Gitana wieder, das man 1838 in Sankt Petersburg für Marie Taglioni auf die Bühne brachte. Im April 1839 wurde das Ballett dann auch in Wien aufgeführt, um die Zeit, als Strauß seinen Galopp komponierte. Der älteste Walzer der vorliegenden Zusammenstellung ist der Tivoli-Rutsch-Walzer, den Strauß bei einer Veranstaltung am 9. Oktober 1830 im Tivoli, einem Vergnügungspark im Wiener Vorort Obermeidling zum besten gab. Wie der bis heute erhaltene, um die gleiche Zeit entstande Vergnügungspark in Kopenhagen, entlehnte der in Wien seinen Namen der antiken Sommerfrische außerhalb Roms. Das Wiener Tivoli wurde im September 1830 eingeweiht, mit Strauß als einem der Musikdirektoren. Am 4. Oktober lockte eine Feier zum Namenstag des Kaisers Franz sechstausend Besucher an. So viele mußten abgewiesen werden, daß eine Wiederholung der Feier arrangiert wurde, bei der Strauß dann seinen neuen Walzer aufführte. Der Titel stammt von einer Rutschbahn, die zu den Hauptattraktionen des Parks gehörte – nicht die Art Rutsche, auf der Kinder (und natürlich manche Erwachsenen!) auf dem Hinterteil hinabgleiten, sondern eine, die Paare in einer Art Schlittenkutsche befuhren. Das Rutschen wird in der Coda des Walzers, einige Takte vor dem Schluß, eindeutig dargestellt. Im November 1839 erklang im Sperl, einem der beliebtesten Tanzsäle im Wien jener Jahre, der Wiener Gemüths-Walzer von Johann Strauß (Vater), der dem jungen Fürsten Nikolaus Esterházy (1817-1894) gewidmet ist. Ein anderer Strauß-Walzer namens Loreley-Rheinklänge ist wohl einer seiner beliebtesten. Die Einleitung enthält eine unverwechselbare viertönige Phrase samt Echo für Klarinette und Horn, die auf weitere Abhandlung im Hauptteil des Walzers vorausweist. Die Komposition wurde anläßlich ihrer Uraufführung bei einem Sommerfest im August 1843 von den mehr als dreitausendvierhundert Gästen mit überschwenglichem Beifall aufgenommen. Das Fest war eine Wohltätigkeitsveranstaltung für das Wiener Kinderkrankenhaus St. Joseph und fand bei schönem Wetter in einem weiteren Wiener Veranstaltungsort für Sommervergnügungen statt, dem Wasser-Glacis im ehemaligen Wassergraben um die alten Stadtmauern Wiens, die bis Ende der 1850er Jahre erhalten blieben. Durch alle Epochen erklangen in den Ballsälen immer wieder neue Tanzstile, und in den 1840er Jahren waren sie vom Polkafieber ergriffen. Die Annen-Polka von Johann Strauß (Vater), nicht zu verwechseln mit dem bekannteren Werk gleichen Namens von Johann (Sohn), war erst sein zweiter Tanz in diesem Stil, sollte jedoch eines seiner populärsten Stücke bleiben. Es wurde erstmals im August 1842 bei einem Sommerfest im Volksgarten zu Ehren der Kaiserin Maria Anna gespielt. Die Salon-Polka wurde ebenfalls im Volksgarten aufgeführt, aber im Juli 1844 bei einer abendlichen Benefizveranstaltung für Strauß selbst. Was den kuriosen Titel Eisele- und Beisele-Sprünge betrifft, so geht er auf zwei Figuren einer Zeitungskarikatur zurück, den Baron Beisele und seinen Adlatus Dr. Eisele, die Anfang 1846 in der Münchner humoristischen Zeitschrift Fliegende Blätter erschienen waren. Die Zeitschrift hatte den Einfall, die beiden Karikaturgestalten auf Tournee zu schicken, die sie im November 1846 auch nach Wien führte. Das öffentliche Interesse war phänomenal, und die zwei Figuren hätten genauso gut leibhaftige Berühmtheiten sein können. Ihr Bildnis wurde in Marzipan und Porzellan reproduziert, und man veranstaltete ihnen zu Ehren Schwänke auf dem Theater, und natürlich Bälle. Für einen davon im Februar 1847 im Odeon-Ballsaal komponierte Strauß diese fröhliche Polka, deren federnde Phrasen den Sprüngen des Titels entsprechen. Die Exeter-Polka entstand hingegen aus Anlaß einer Reise, die Johann Strauß persönlich vom April bis Juli 1849 nach London unternahm. Es war sein zweiter Besuch in der britischen Hauptstadt – der erste war 1838 zur Krönung von Königin Viktoria erfolgt. Einer der Säle, in denen er mit seinem Ensemble auftrat, war die Exeter Hall, die damals an der Straße The Strand stand, wo sich heute das Strand Palace Hotel erhebt. Für das erste seiner dortigen Konzerte am 14. Mai 1849 komponierte Strauß die Exeter-Polka. Leider sollte sie sich als eines seiner letzten Werke erweisen. Kurz nach seiner Rückkehr nach Wien steckte er sich bei einem seiner unehelichen Kinder mit Scharlach an und starb am 25. September im Alter von nur fünfundvierzig Jahren. Die Fortsetzung der Strauß’schen Familientradition übernahm sogleich sein ältester Sohn, der damals schon sein eigenes Orchester leitete. So war die Scherz-Polka von Johann (Sohn) nur wenige Monate nach dem Tod von Johann (Vater) erstmals im Ballsaal Sperl zu hören. Der Titel bezieht sich nicht auf einen bestimmten Scherz, sondern auf die allgemeine Verspieltheit der Komposition. Die Musik des jüngeren Johann war stets lyrischer, entspannter und kultivierter als die seines Vaters, dessen unstillbare Rastlosigkeit dem Stil des Sohnes abging. Das zeigt sich besonders klar in den eleganten Liebeslieder-Walzern, die zu den ersten großen Erfolgen von Johann Strauß (Sohn) zählten. Sie wurden im Juni 1852 bei einem Sommerkonzert im Volksgarten uraufgeführt. Von den weiteren Stücken wurde Thermen für einen Ball der Medizinstudenten in der Wiener Hochschule im Januar 1861 geschrieben. Die südliche Wärme schließlich, die Wo die Zitronen blühn ausstrahlt, kündet davon, daß Strauß das Stück für eine Italientournee im Jahre 1874 komponiert hat. Er dirigierte es erstmals in Mailand unter dem Titel Bella Italia. Der deutsche Titel geht auf das Lied der Mignon aus Goethes Wilhelm Meisters Lehrjahre zurück: ‘Kennst du das Land, wo die Zitronen blühn?’.